I advise you to participate in the Party Poker action POWERFEST CLICK which runs from 2 to 23 September. A very profitable campaign to increase the bankroll !!! Similar Threads for: POWERFEST CLICK!!!!!!! Is party poker available for US poker players? 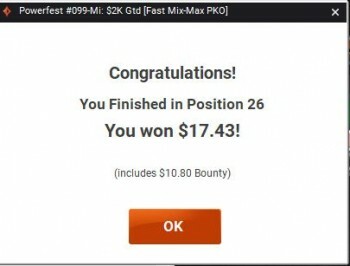 re: Poker & POWERFEST CLICK!!!!!!! Yeh, it is an awesome promotion. Don't forget that you can also get some tickets using your Bwin account. I regret I have to tell you the simple answer is no. It seems to me that there give tickets to those who play a lot for cash and tournaments POVERFEST. And second place on 5.5 KO with ticket i got yesterday!! I had a good day on PP with these tickets. I used 2 of them and cashed in 1 (the $1.10 ticket) with a deep run finishing 26/4297 and collected 8 bounties. I also won a $16.50 ticket on the click-card promotion.